In the above video, and in the below 10 steps, I teach one of the most basic and essential skills in traditional woodworking: how to square, flatten, & dimension your own rough lumber into finished boards. 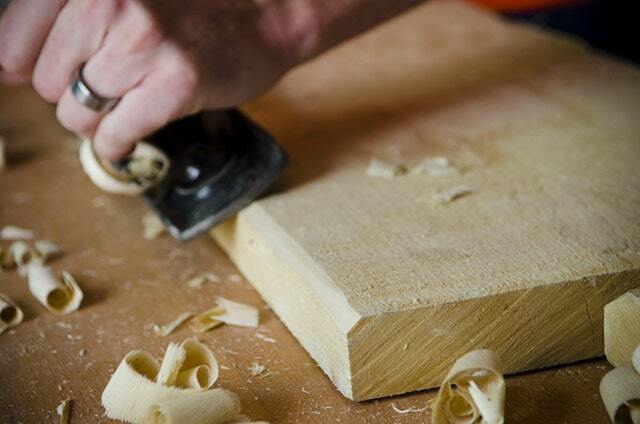 To build quality traditional furniture, you need to start with perfectly flat and square lumber. Some people achieve this with power jointers, planers, and table saws. While the electrical power route is more economical for a commercial woodworking workshop, I prefer the safety, exercise, quiet, and historical feeling that comes from dimensioning my boards by hand. Plus, it just makes you feel cool. 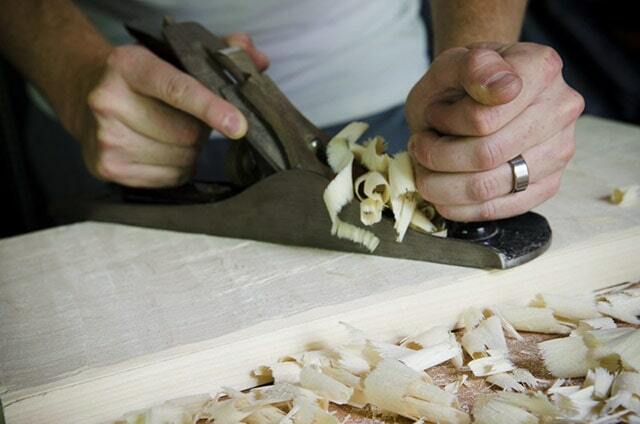 Sure it takes a little longer, but why did you get into woodworking in the first place? To hurry and build a bunch of stuff, or to enjoy yourself? It’s therapeutic to take some things slowly. And with practice, squaring lumber by hand won’t take all that long…ask your ancestors. 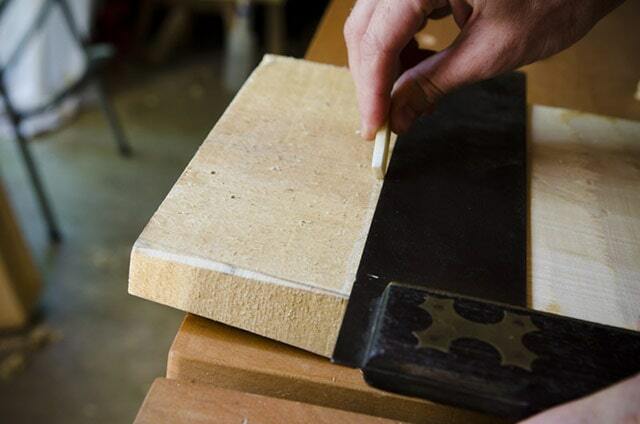 Use a longer try square (12″ +) to mark your rough board’s approximate length. 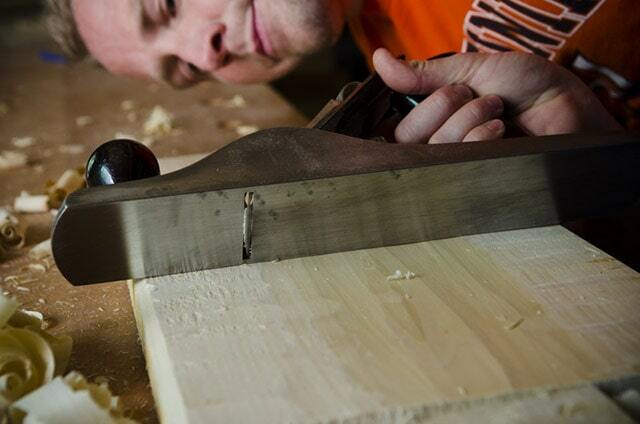 Then use a Cross Cut panel saw to cut your rough board to rough length (across the grain). Keep in mind that this isn’t your final length. You’re just removing any messy wood, and getting to a manageable length; somewhat close to what you’ll eventually arrive at. Place the board between the bench dogs with the arced side facing up, to avoid rocking. 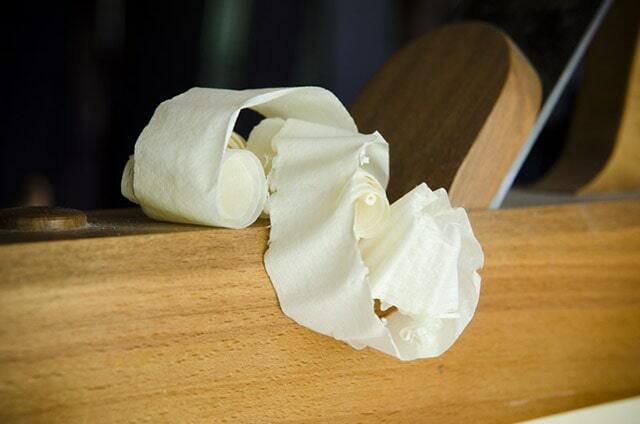 You may need to use shims if your board is in really bad shape. Use a scrub plane or a jack plane with a cambered iron (8 degree camber/arc). This plane is going to be doing rough work, so don’t worry about tuning it extensively. Then plane across the grain, from one end to the other. 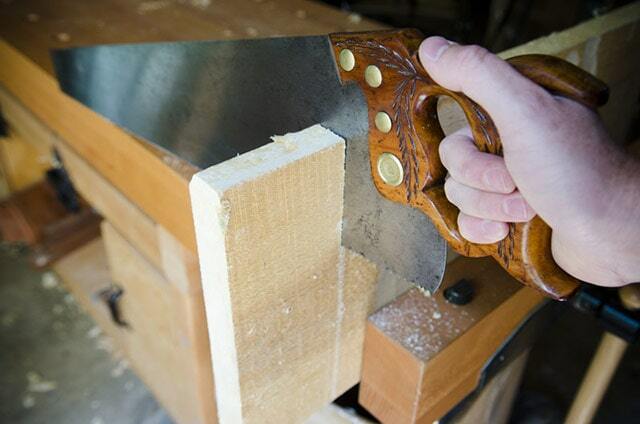 Adjust your plane so that your shavings are as big as possible, while still being able to move the plane. 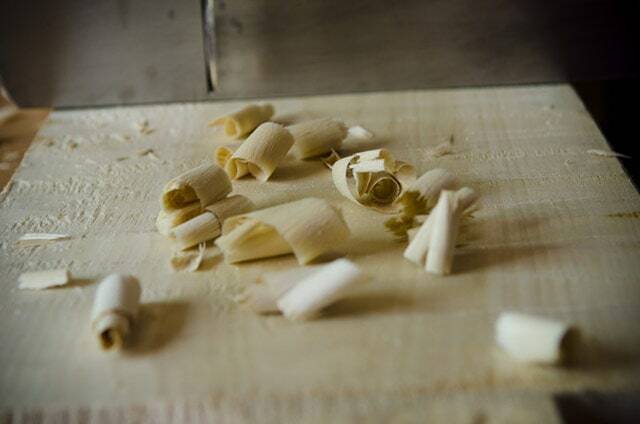 This board dimensioning blog post continues on the next page…. This site is amazing. There is so much terrific information! This is one of my favorite and “go to” videos. 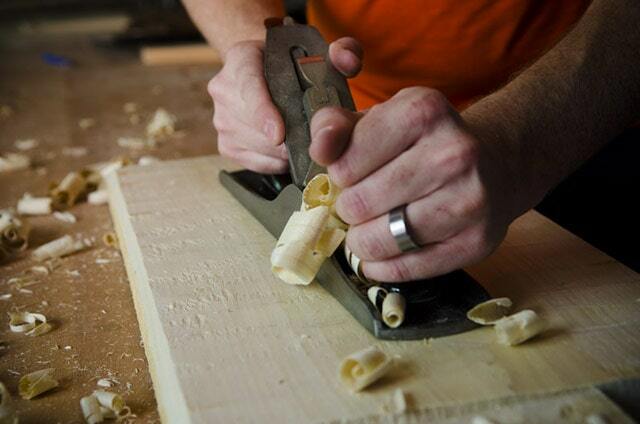 I love to reference it before I grab my hand planes. Those clamps in the give away look great and I would be rheilled to get them. If I do not win those, I would like the Shaker Candle Stand video. The shirts all look great but i really like the red or brown hand plane shirts. My size is XL. This site is excellent. I had no idea that it existed. I’m going to pour through all of these forums as I am sure that I will be able to glean much! Great idea, Joshua – having a giveaway to bring woodworkers to this site. Kudos! Glad you found my site Odee! How did you find it? I have a 2x8x12 plank of wood that is splintered and looks like it’s been through the ringer a few times. Lots of water damage, but it looks beautiful. I want to make a planter box out of it, but it needs to be planed. What is your recommendation? 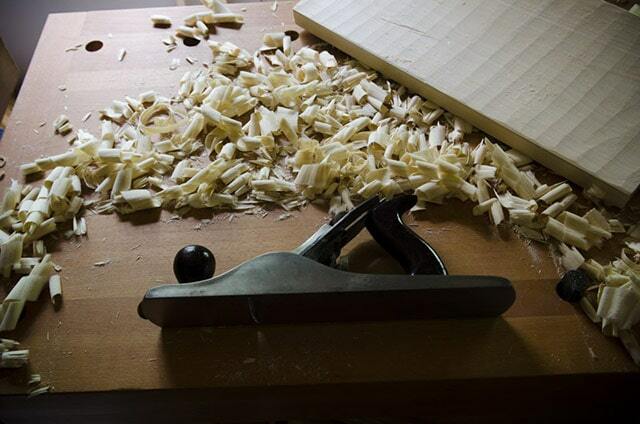 It couldn’t hurt to use a hand plane to plane it down and see how it looks! 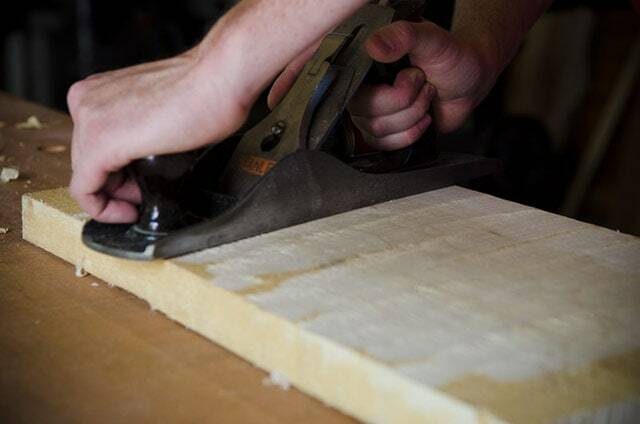 If you need 1/2 or 1/4 inch thick boards for a project, where do you get them from? 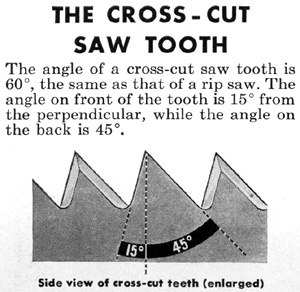 I find a lot of evidence that people are resawing with a bandsaw, a few who resaw by hand, some people buy wood cut to thickness. 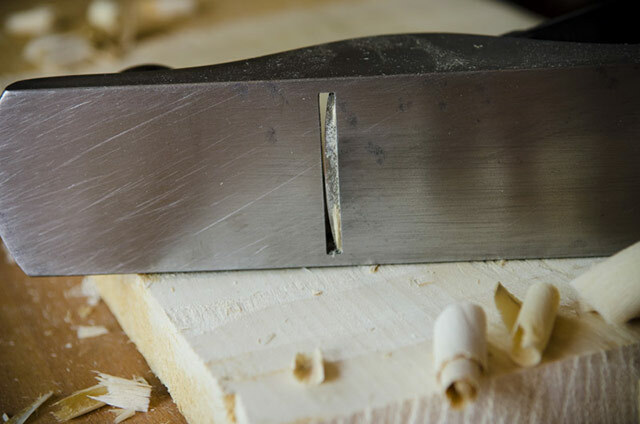 In this article you had wood that could be planed to thickness – what if it had needed to be half this thickness. How do you dimension thickness?? Joshua, Thanks. I am just getting started with woodworking. I noticed that most of the sources are selling rough stock at 4/4 or larger, but project demos seldom talk about getting it dimensioned to thickness. Your site is an amazing resource; I just discovered it while hunting for compass/divider advice. 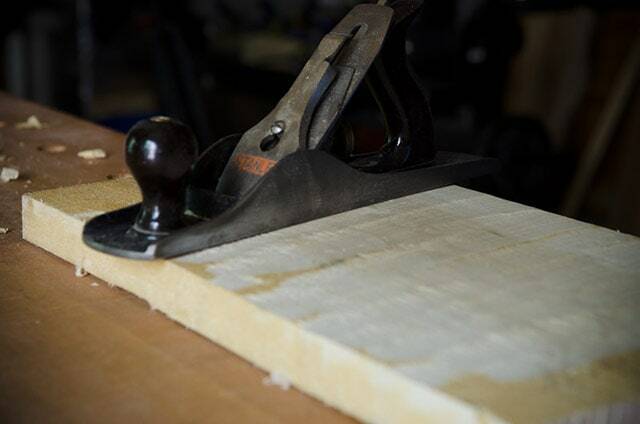 And for smaller boards, you could always use a hand saw to rip it to a more narrow thickness, but it’s a lot of work! Hope to see you asking questions on the forum! I found your post about hand planing enormously helpful as research for a story I am writing about a 17th century French boy who’s truing up warped boards for a primitive fort. I wonder if you would be so kind as to share with me any sort of accidents or injuries that might occur to someone undertaking this task. Thank you for your consideration. Really, 17th century, building a fort. Tough it up. You build a house today, and you hit your finger with a hammer, are you going to lay down and die?